Stuart Watkiss signed his first three players in readiness for the big kick off in August and two of them have a decidedly aged look about them. 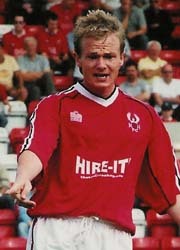 As mentioned in a previous news item this week one of those was the ex Walsall hard man Wayne Evans. He has put pen to paper for a year long deal after his six year stay at Rochdale where he was one of the big favourites of the Spotland crowd. Another big favourite from up Manchester way was another ex Midlander who played for Rochdale and now has signed a similar contract as Evans to play for us. 34yr old Daryl Burgess was a stalwart at West Brom for many years before signing for Northampton Town in 2001 and then for 'Dale in 2003 where he too became a valued defender for them. The third one is, according to Watkiss, one for the future. Laurie Wilson is the son of the former Barnsley and Sheffield Wednesday manager, Danny Wilson, and had been playing in midfield for Burton Albion last season after being released from Wednesday in the summer of 2004. The 20yr old never made a first team appearance for them but was highly rated. Still didn't make the grade there though and obviously not at Burton either. We'll see how he gets on under SW but he could be another Scott Rickards or Matt Lewis. Sadly with the three new players coming in it was also the day to say goodbye to Dean Keates. Following the end of last seasons relegation he decided that he did not want to ply his trade in Non League football and wanted to sign for a League side. Today he signed for Lincoln City on a one year deal for Keith Alexanders 'new look, new style' side. Until they find they miss the aerial bombardment football they've been playing for the past twenty years. In his time here the terrier like Keates won a lot of admirers and our best wishes go with him.